The picture-phrase combination rested on at least three propositions. Like some concession-stand barker the phrase hails the viewer with the question, “Who needs to own this view”? Who needs this real authentic piece of art-of-life at a distance, this art of living, this blending of architecture and man-made landscape that has been carefully constructed as the future of this place? The second connotation questions the aesthetic and/or cultural value of works of art as we know them; when at the end of the day you can own this view, who needs works of art on the wall, or even further afield in the city? The third level of meaning emerges from the frenzied, speculative, seemingly recession-proof Vancouver real estate market: art is a poor investment when compared to this view, which is the primary asset of the property (the sunset warns the viewers that time is nearly up).2 The view of False Creek—the view of Vancouver’s view of itself—supplants the work of art. In this inlet, the mirror of the city’s own image is intensified. 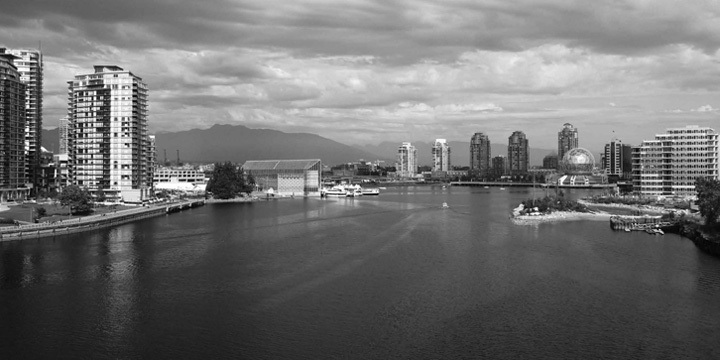 In his examination of two popular panoramic photographs—one taken in 1978, the other from 2003—that capture views looking eastward from the Cambie Street bridge toward the east end of False Creek, the writer Derek Simons asks if the “undeniable pleasure of looking at False Creek” through the lens of this double panoramic moment “may be linked with the ordering of space in False Creek, False Creek in the image of False Creek as an image.” 3 These two photographs have been posted on the Vancouver Planning Department’s website for several years and share a striking resemblance to the eastward vista in Concord Pacific’s ad campaign.4 Simons claims that the two panoramas of the Creek, describe Vancouver as an “impressive city”, or a place “where the trace of human effort is so precisely and ubiquitously fixed and eliminated” by the extensive world of molded and abstracted concrete that locks it into place. While the article’s main focus is the materiality of the plazas and walkways, the tall, gleaming, white steel towers of Concord Pacific Place are as much a part of this impressive concrete matrix as the geometries of grey material that buttress their edges. If the phalanx of gleaming towers resembles so many upended cruise ships it’s because north False Creek itself has become a cruise ship: private, cabin-sized rooms, expansive promenades and antiseptic mega-yacht club-like aura.5 As one writer puts it, the promenade is “the sine qua non of all waterfront development in Vancouver.”6 Perhaps this is why we are so astonished when this lawn fringed concrete girdle of seawall and its attendant lapping tide, are literally drained away in Tony Romano and Tyler Brett’s False Creek panorama. In fact, most of the beloved elements of “Vancouverism” are washed away from the artists’ large print, like so much kelp from a beach. Gone is the podium architecture with high pointed towers; gone are the beach side bistro and Holland Cruise handrail. In their place we witness a topology of ghosts. The link between False Creek, the vehicular and the squat is fundamental to False Creek’s character.8 Regarding the vehicular: significant portions of the False Creek’s landfill (and the fill of False Creek Flats more generally) is made up of junked automobiles from Vancouver’s earlier modern period. The stack of cars on the right of Romano and Brett’s image suggest the 217 metre-long uniformly grey sculpture Highway 86 which “rose out of the sea like a giant undulating serpent” during the world exhibition 9. That the marketing material for Highway 86 suggested that visitors use it as seating anticipated Romano and Brett’s own interest in the vehicle as furnishings for the Creek. Time-space compression is a critical part of False Creek’s mode of display. An early 20th century industrial taxonomy is fused with elements from a glasnost era urbanism.12 The structures within the panorama recall the tubular truss-frame pavilions of the World’s Fair and their logical heirs, the mobile condo showhomes (complete with mobile hedgerows) at the turn of the century. In False Creek, Romano and Brett willfully combine the intent of two other waterfront art projects: the historical salvaging of a rustic pre-history in Liz Magor’s LightShed (2004), with its resurrection of early Coal Harbour industry, and Jerry Pethick’s Time Top (2007), which proposes Vancouver as some cartoon-like Atlantis.13 The children’s book-style rendering of the illustrations and sculptures—with their vibrant reds, yellow, and blues—and the storyline based on a post-apocalyptic future creates an affiliation with Larissa Lai’s Saltfish Girl (2002). In this novel Lai incorporates Hans Christian Anderson’s Little Mermaid and traditional Chinese stories into a broader narrative about a city, called Serendipity, built on the remnants of an entropic 20th century Vancouver, complete with a partially submerged and decrepit Pan Pacific Hotel. In contra-distinction to this version of societal rebirth and childhood struggle is Ernie, the Expo 86’s mascot, whose dark NASA-like visor and silver lamé suit seemed to anticipate the shimmering reflectivity and blank optimism of False Creek’s steel and glass facades. Essential to Romano and Brett’s sensibility more generally is the utopian possibility suggested in the blending of folk with futurism. British Columbia is no stranger to utopian communalism and the reimagining of life post-calamity. The province was a hotbed of utopian communities in the latter half of the 20th century. “Against the sparse backdrop of Canadian utopianism,” Justine Brown asserts that “B.C. is a glaring exception.”14 The elevated structures of the panorama recall the Post-War Dollarton Mudflats colony of squatters who clung to the stilt houses; “in the disputed territory below the high-tide mark, the crablike squatters constituted a form of intertidal life.”15 Yet, the east end of False Creek is a most uncanny and fraught site for the fusion of folk and future. The narrative of futurism and folk underwrote the site in the original buddy movie pairing of Expo Centre (whose structure of which now houses Science World) and Folklife (on the site of what is now the eastern edge of the Olympic Village). These two buildings were the pride and joy of Expo 86. “Just a short walk away from the futuristic Expo Centre,” the Exposition program guide explains “Folklife is an elegant horseshoe-shaped complex of natural cedar buildings, boardwalks and a grassy village common, a warm intimate atmosphere permeates Folklife.”16 The main buildings included The Barn, The Big House and The Common and featured Caribbean music to Doukhobor dances. In Romano and Brett’s rendering, the Olympic Village becomes the basement for more important social spaces/activities floating high above it. Science World is reduced to its partially dismantled latticework structure—an image that evokes the very first performative experiments with the `bucky ball’ domes performed by Intermedia artists on the shores of False Creek in the 1960s. The False Creek exhibition also includes a series of sculptural elements that resemble scenes from the panorama. The three distinct sculptures are modular and vaguely familiar as automobile forms, though reconfigured and incorporate what appear to be vernacular architectural materials: upturned corrugated siding, wood-framed pitched roofs. One of the automotive forms turns out to be that of a Chevy Colt. The chassis has been turned on its back and a bicycle frame placed on top; the hood is covered with the kind of plastic siding found on the exterior of cheaply constructed houses. Another car—what appears to be a mid 1980s Porsche—has an A-frame structure sutured onto its back end; the original sunroof has been mounted on the steep side of a pitched roof growing out of its frame. Like many of their reimagined vehicular dwellings, the artists have found new uses for old forms. In this second assemblage, the wheel wells function as planters. The third car, a Pontiac Fiero, has a paddle wheel and siding built out of its front. Each pod is mounted on large plastic spheres that resemble exercise balls or ocean buoys. The late-Mondrian geometric colour scheme—which matches the official Olympic colours, not accidentally—combines with a monstrous, paddle boat architecture to propose a vanguard Rube Goldberg-like utopianism. The angular diagonals of Romano and Brett’s rafts recall, what was referred to as the “motion wedge” of General Motor’s Pavilion17 During the World’s Fair in Vancouver, General Motor’s promised that their 2000 square foot pavilion would be a “highly entertaining attraction” and would present “leadership in automotive technology”. The event was commemorated with special editions of the Pontiac Grand Am, Olds Calais, Chevy Astro and GMC Safari van. Romano and Brett are interested in the high tech obsolescence built into the vernacular automobile of the late 20th century. While the futurism might quickly fade as these vehicles role “off the lot,” their unanticipated characteristics point to ways of living in the future. The angular diagonals of Romano and Brett’s rafts recall the so-called “motion wedge” of General Motor’s Expo Pavilion.17 During the World’s Fair, GM promised that its 2000-square-foot pavilion would be a “highly entertaining attraction” and would present “leadership in automotive technology.” The event was commemorated with special editions of the Pontiac Grand Am, Olds Calais, Chevy Astro and GMC Safari van. Romano and Brett are interested in the high-tech obsolescence built into the vernacular automobile of the late 20th century. The futurism may fade soon after the vehicles roll “off the lot,” but their unanticipated characteristics point to ways of living in the future. While these reconfigured vehicles are set upon brightly coloured carpets within the exhibition space of the Pendulum Gallery, these forms suggest a water environment.19 The artists call them “rafts”, which conveys a sense of nomadic drift. False Creek, like Coal Harbour, has provided berth for many a raft-like structure.20 Over the years, many temporary dwellers and marginal visitors have lived at the water’s edge in makeshift watercraft and floating residences.21 Expo 86 also showcased “Canada’s first floating McDonald’s restaurant”, a structure that would later become a floating ruin—and sometimes squat—stranded adjacent to North Vancouver’s Deep Cove. The centrality of the squat to False Creek recalls Simons’s claim that the interstitial is constantly being repressed, though always re-emerging in False Creek. The relationship to the raft and the squat departs from a survivalism long associated with Canadian culture.22 Like the figures in the Situationists 1960s comic strips, Romano and Brett’s human figures cut a hip and mechanically rendered profile that evokes both the language of fashion spreads and revolutionary agitprop.23 Yet, in False Creek these counter-cultural hipsters are put to work as often as they celebrate through music and rebuilding the world. Their reuse of materials recalls the work of Canadian industrial designer Donald Lloyd McKinley.24 Romano and Brett combine a mixture of wonder and reconfigured irony found in Kim Adams’s “mock vending wagon” Squid Head (2001) with the raw found material feel of Ant Farm’s Cadillac Ranch (1974). But more so, because Romano and Brett’s work is attuned to the playful-critical adaptive logic of Andrea Zittel and Atelier Van Lieshout (AVL). Witness for example, Zittel’s A-Z Escape Vehicle (1996) which turns an Alfa Romeo into a chicken coop. As with the work of Atelier Van Lieshout, in Romano and Brett’s images and objects, “form follows fate… the inherently social dimension and design [goes] one step further.” 25 Yet while the “rafts” of False Creek share some affinity with Atelier Van Lieshout’s anarcho-water vessels like AVL Suisse (2002) and Sonsbeek Raft (2001), they are imbued with a utopian playfulness and deliberate graphic design sense more akin to Archigram than the sado-masochistic meets Survival Research Laboratories thrust of AVL. As the story goes, the body of water and shoreline known as False Creek was named by Captain George Richards in 1859, before Vancouver existed on any map. According to author Catherine Gourley, “On entering the creek [Richards] expected to discover a water link to coal deposits he had noticed in Burrard Inlet. When he met a dead end he gave the basin the mundane – though anticipatory – name of False Creek.” 26 This theme of a place that is not quite what it claims to be reoccurs throughout the area’s recent history. Rather than a dead end, Romano and Brett propose that False Creek’s spectacular mundanity will harbour new inlets into the future. If False Creek’s condition is the constant attempt to rid itself of the interstitial, Romano and Tyler’s False Creek inverts this situation. Here the interstitial becomes the dominant mode; while the master narrative of False Creek emerges in the gaps. The post-podium carnivalesque of False Creek rids itself of an awards ceremony-style urbanism and aura of high performance that continues to dominate its multiple moments.